Oklahoma City Thunder All Star point guard Russell Westbrook notched his 10th consecutive triple double in Monday night's 120-111 victory against the Portland Trail Blazers, breaking Wilt Chamberlain's mark of nine straight set in 1968. Westbrook, who is currently averaging 21, 11 & 11, posted 21 points, 14 rebounds and 11 assists in the win. "Definitely an unbelievable moment," Westbrook said, per ESPN. "I don't know, because honestly, bro, I know what I'm capable of doing, and I just go out and compete and whatever happens, happens, man. I never even dreamed of playing in the NBA or standing here talking to you guys. So, each moment is a blessing for me. Each time I get to walk into this locker room and see my name up there, it's a blessing for me. Westbrook now has 23 triple-double for the season, more than any other player in the league, but he wasn't the only one to do so in OKC last night. Late in the game Westbrook buried a three off an assist from Paul George, giving the All Star forward his 10th assists as he finished with 47 points, 12 rebounds and 10 assists. "We talked about it right before that play, we talked about it," George said, per ESPN. "I was clueless at that moment. 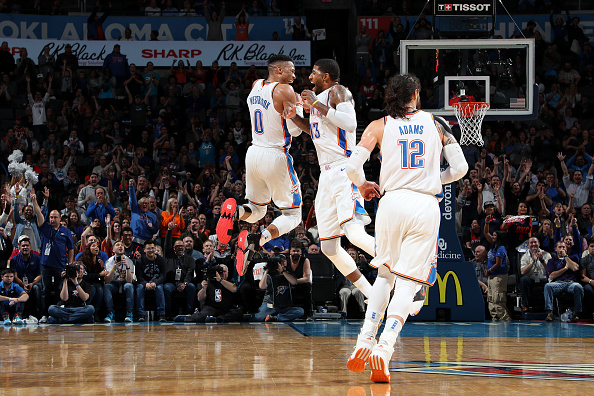 But [Westbrook] told the situation, so it was cool to be on the other end of the triple-double." According to the NBA, Westbrook and George are only the 9th teammates to record triple-doubles in the same game. Furthermore, they're the first teammates to record 20-point triple-doubles in the same game.